I tried a trick for removing rust last night on a Disston possibly No. 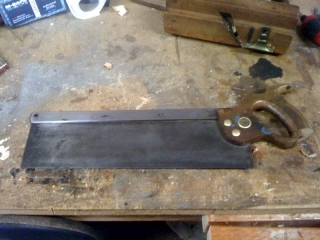 4 steel backed backsaw. It’s a tenon saw I think, and I found it for $7 at an antique store with a busted horn on the bottom of the handle, some light pitting on one side of the blade, and a whole lot of surface rust. But for $7 I couldn’t pass it up, especially since the teeth were in great shape, and the blade was straight. Plus, it was $7. I did some searching on the internet, and found something I could try with what I already had. I took a brand new “scotch brite” type kitchen sponge, sprayed the blade with WD-40, and scrubbed away. It worked quite well, and the rust came off easily. The pitting was only on one side, and doesn’t seem to be too bad, it cleaned up pretty well, and once I put the handle back on the saw it made some decent cuts in some sacrificial pine. All in all, worth $7. The handle chip on the bottom horn doesn’t impact utility, and is still very comfortable. I might glue a piece of wood and bring the shape back, or I might just use the thing as is. I’ll try and snap some pictures tonight, I didn’t have my iPhone on me last night. Still working on my Day 2 write up for my visit to Woodwrights School, more on that later.